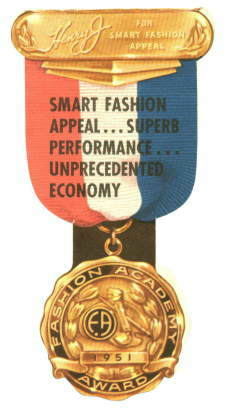 This is a small paper item, measuring about 3 x 6 inches, used by KF dealers in the showroom to show off the Henry J as a Fashion Academy Award winner. A number of KF cars were Fashion Academy winners and Langworth points out in his book that Joe Frazer had some influence in such circles. This item was loaned to us by Mike Barker. It is designed to hang over the steering wheel in the Henry J sitting on the showroom floor to call to the attention of the prospect that he or she is looking at an award winner! I don't know if this helped sell any Henry J's, but it's a nice item for the colllector! I want one for myself. The obverse side differs only by omitting the Smart Fashion Appeal...message.